Parrot cichlids are quite popular by many but you must understand that this is not a naturally occurring cichlid. These fish are hybrids which mean they are man-made. Supposedly these fish were created during the mid 1980’s in Taiwan. It’s unclear as to the exact percentage of their makeup but many people believe this fish to be a combination of Amphilophus citrinellus and Heros severus. Some even say there may be Theraps synspilum in there as well. Did you know there is another cichlid which goes by the same name, parrot cichlid fish? There a cichlid fish which shares this same name and it’s not a hybrid. 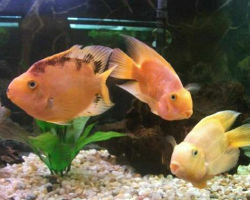 Hoplarchus psittacus is a large South American cichlid that actually requires advanced knowledge to maintain and breed, this is considered the true parrot cichlid. Did you know parrot cichlids are man-made fish? These fish are not found in the wild. 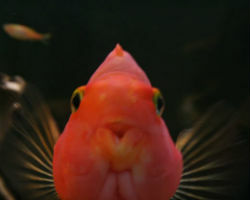 This fish is deformed especially its mouth which makes it somewhat usual looking. Some people keep a few together or a school of them, five to six specimens in a larger aquarium. 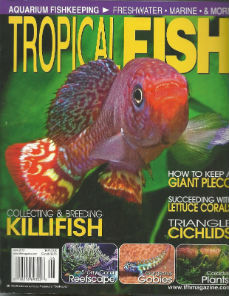 Many aquarists including tropical fish clubs are against the sale of these as they are man-made. Again this “cichlid” is not for everybody. 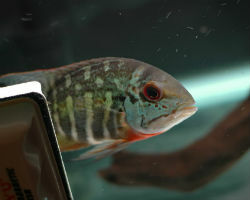 Like most cichlids it’s relatively hardy and tolerates water directly from the tap. In terms of breeding these guys, it is not uncommon for the males to be infertile. 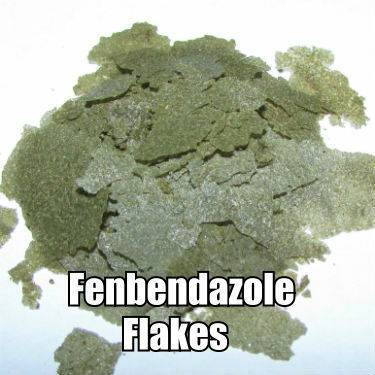 Most likely these are artificially reproduced manipulating science for the purpose of revenue. Beauty is in the eye of the beholder.